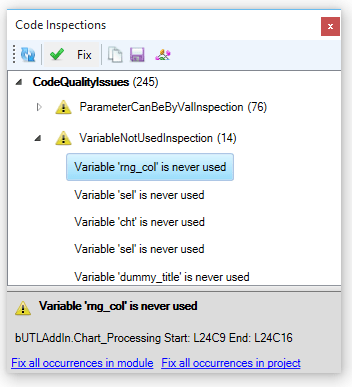 One of my favorite features since we started working on this project, is the Code Inspections. I like it because, well, it does find things. Here Rubberduck 1.4.3 would say “Variable ‘ax’ is never used” – and suggest a quick-fix to remove the supposedly unused declaration. A quick-fix which, of course, would break the code. Is there a bug in the VariableNotUsedInspection code? Believe it or not, there isn’t. What makes the inspection fire up false positives, is a bug in the identifier reference resolver that causes member calls to ignore the “parent” reference. You get a “Variable ‘fWeekOfMonth’ is not used” and “Variable ‘fQuarterOfYear’ is not used”, because the only place they’re ever used is in For loops. WithEvents variables are likely to be assigned a reference, but not necessarily to be themselves referenced anywhere. And if they aren’t, well then, they’re reported as “never used”. Which is a problem, because you don’t want a quick-fix to go and delete the WithEvents declaration that provides all these events you’re handling. So we’re going to be ignoring WithEvents variables. Okay… Got any Good news? …most inspections will support “Fix all” options. Of course one shouldn’t “fix all occurrences in project” without actually reviewing the inspection results. But so far, it’s looking very, very good. This UI is still preliminary: we’re happy to hear (and integrate) your feedback! Feature-freeze until this is completed. We need to implement proper DI/IoC and make the code testable, if not tested. No ifs, no buts. So we’re ready to start implementing the new features of 2.0. But before, we need to reconnect the pieces, by moving code from the 1.x “RubberduckMenu” and “RefactorMenu” classes, and into these “ICommand” implementations. Regex Search & Replace is coming. We’ll need a way to hijack Ctrl+F and Ctrl+H! Smart Indenter is coming. The owners of this awesome add-in have graciously offered their source code to the Rubberduck project a while ago already; 2.0 isn’t releasing without an embedded Smart Indenter! More grammar fixes on the way. This means fewer parser errors, more accurate inspections, navigation and refactorings, i.e. a more reliable tool. Source Control Integration continues to improve, and early minor releases of 2.x will likely see a new WPF/XAML UI. More translations have been completed since the last release: 2.0 will speak English, French, Swedish, German, Japanese… and every other translation we receive a PR for in the next.. uh… …6-8 weeks. Shiny new UI. Docked gridviews are turning into WPF treeviews; the “Rubberduck” menu has been revamped, and under the hood, everything changed. Might as well make 2.0 look like as much change happened! Code Inspections and Quick-Fixes that take the host application into account, giving recommendations tailored for a given host API. Also, some of the coolest inspections we envisioned as fantasies a year ago, are now possible to implement. More refactoring tools like inline method, encapsulate field and promote local. The early minor releases of 2.x will likely see a new WPF/XAML UI for the refactorings issued in 1.x. Something really good is cooking. We’re also looking at implementing a more VBA-like Assert class, that would be more permissive with AreEqual and AreNotEqual than the current (C#-like strict) implementation is. Test results will be copied to clipboard or exported/serialized to XML with a simple click.